Whale hunting was vital to Scotland’s economy in the 1750s. Many North East vessels took part in the highly dangerous expeditions to places including Antarctica. Whaling ships were commonplace in Aberdeen Harbour but, on 1st April 1813, events unfolded that had a dramatic impact on the whole community. The Hercules, Latona, Middleton, Oscar and St Andrew, had laid anchor outside the port. With some crew ashore the Oscar and St Andrew had remainedcloser to the harbour mouth. 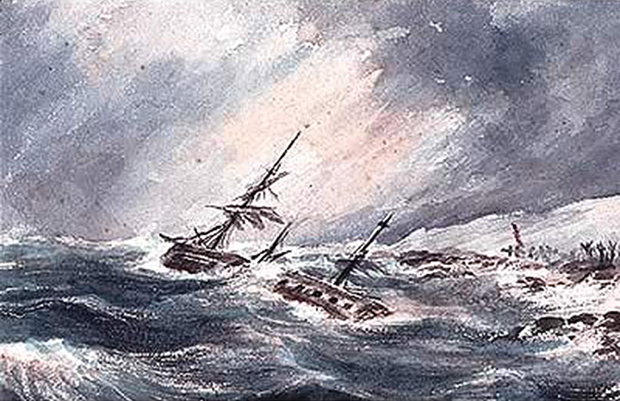 When a squall of severe weather blew up, both vessels were forced to stay near land awaiting the return of their crews. By the time the crew was back aboard the Oscar, a second squall hit. The vessel was caught and her anchor started to drag. She finally grounded on the rocks at Greyhope Bay, where the sea continued to pound her. She broke up almost immediately. Knowing they were in perilous danger, the crewmen cut down the Oscar’s mast to use it as a bridge to the shore, but it fell the wrong way, killing those who had been clinging to its rigging. Relatives gathered on the shore, helpless in their efforts to save friends and family. Instead they were forced to watch as the crew, including the Oscar’s Captain, John Innes, were overcome by the heavy seas. Amazingly, two men out of the crew of 45, John Jameson and James Venus, did survive. For the relatives of the other crew members, the following days were spent visiting the beach as the bodies of their loved ones were washed ashore. remembered in place names such as Oscar Road in Torry.